Here’s one for all of you sport tourers who look at bikes like the Ducati Multistrada, BMW 1200 GS, BMW S1000XR, or Aprilia Caponord and wonder why they’re all so underpowered. Why can’t a guy ride across the country and attempt to affect the rotation of the Earth at the same time? Well, now he can. 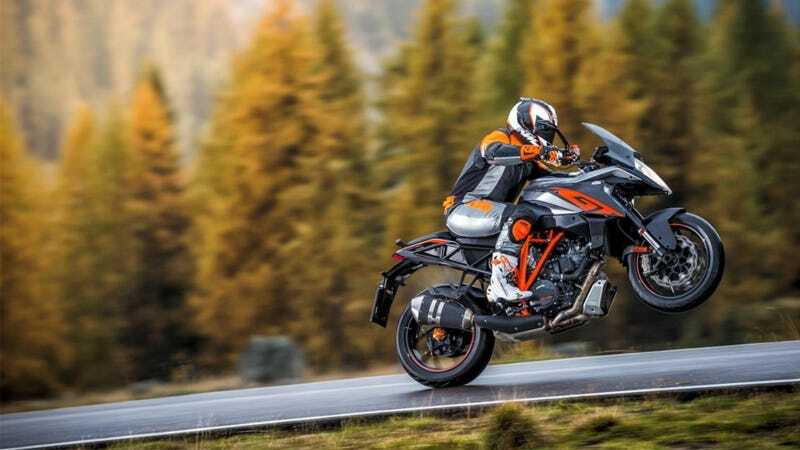 The KTM 1290 Super Duke GT is a sport tourer (emphasis on sport) based on the flame breathing, 173 horsepower and 106 foot-pounds of torque motor from the Super Duke 1290 super naked. The 1,301 cc V-twin has been retuned slightly for, as KTM call it, “more appropriate power delivery,” which maintains the same power figures but moves peak horsepower from up to 9,500 from 8,865 and moves peak torque down from 7,750 rpm to 6,750 rpm. It also comes with semi-active WP suspension, which can be toggled between sport, street, and comfort settings. With that riding style preference in mind, a suspension adjusts damping and spring settings to the road surface. As expected, the Super Duke GT gets a full host of incredible electronics - including KTM’s incredible lean angle sensitive stability control system. Like the one in the Ducati Multistrada I tried, and failed, to crash, the system takes lean angle into account to provide cornering ABS and traction control which basically make low siding from too much throttle or braking while at lean a thing of the past. While this isn’t brand new tech for this bike, it’s maybe the most appropriate for a bike that’s intended to be ridden on far, remote roads and ridden enthusiastically. The KTM 1190 Adventure at times felt like a massive supermoto to me, and it appears I’m not the only person who like to ride these big KTMs like one. The GT will have a “supermoto” mode, which turns off ABS. It also comes with a slipper clutch, quick shifter, and optional HHC (Hill Hold Control) and MSR (Motor Slip Regulation). HHC basically keeps the bike from rolling backward if you’re trying to pull away from stop while on a hill (for those of you who have difficulty holding the rear brake). MSR “prevents the rear wheel from losing grip, should the rider chop the throttle or dump the clutch when downshifting,” but I’m pretty sure that’s what the slipper clutch is for so I’m not sure why this is necessary. To make the bike a little more distance friendly, KTM gave the Super Duke GT cruise control, heated grips, a tire pressure monitoring system, LED cornering lights, and self cancelling indicators - because nothing is more annoying than having to turn off your own blinkers when you’re on the road a long time. The pegs have also been lowered slightly and the bars can be moved 22 mm to one of four different positions. Wet weight comes in at nice 502 pounds, which they say includes a filled six-gallon gas tank. The sport-touring field is maybe one of the most wildly varied ones in all of motorcycling, with “sport touring” on anything from Kawasaki Concours 14s to Suzuki Hayabusas to Ducati Multistradas. This sort of looks like a mix of all three seating positions, only with better tech and more power than all of them. Unless they really screw this up somehow, the KTM 1290 Super Duke GT is the new king of the hill.